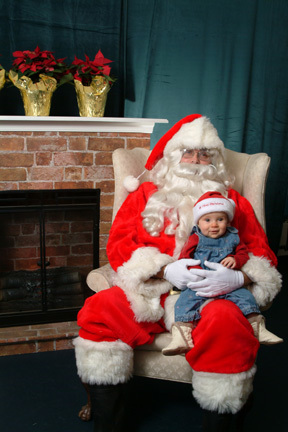 Digital Photos With Santa Claus at your private event being held in the MD, DC and VA area. Quick, professional pictures printed on site for you and your guests to take home. Digital Pictures with Santa - Are you tired of waiting in line at the mall for a chance to tell Santa what you want for Christmas? Step right up, sit on Santa's lap, tell him what you want, and get a picture too! Elves, Santa's helpers, Mrs. Claus characters also available. Brick fireplace, Santa's chair, and backdrop add that special touch to your event. Includes film, photographer, Santa, and 4" x 6" digital photo. Requires electricity (110 volt, 20 amps), a 6' table, (2) chairs, trash can, and 12'w x 6'd space. Photos party favors can be put inside a sno globe, frame, magnet, keychain or ornament for an additional fee. You can even have your picture put on a T-shirt!